We are very proud to present our new musical extravaganza at Posidonia Banus. 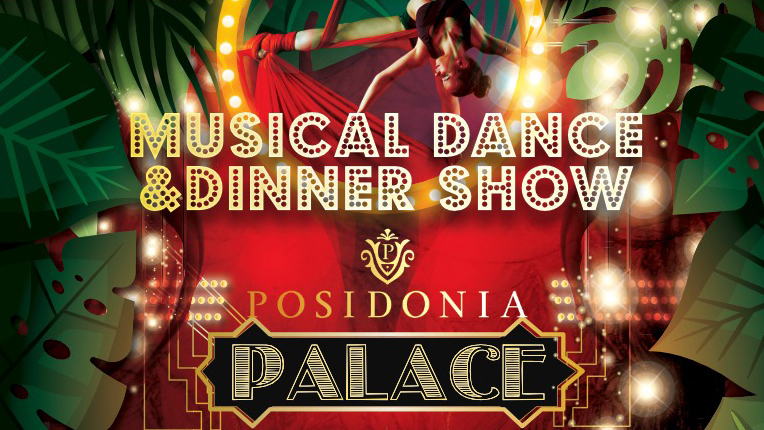 The Posidonia Palace Musical Dance and Dinner Show will bring six talented dancers, two DJs, a well-known singer and an aerial performance, to create a powerful and exciting new show for the Costa del Sol. Choreographed by Jose Maria Sibon de la Flor from Creative Dance Style, there will be 10 carefully staged dance numbers during the two-hour show, as well as impressive aerial performances. Singer Alex Forriols, who rose to fame as a finalist in the hit show La Voz (The Voice) will be singing and dancing as part of the show, performing five hits and blending music and dance. DJ Duo E T H E R will provide the soundtrack before and after the show, as well as supporting the strong song and dance performances with carefully selected tunes to create the best atmosphere throughout the evening. Arrive at 9pm for a glass of cava and music from DJs E T H E R. Then enjoy a delicious mixed starter platter, which includes Smoked Salmon, Foie Gras, Tuna Tartare and a Mediterranean Salad. The fabulous show starts at 10pm and after midnight DJs E T H E R will keep the atmosphere alive until 2am. Tickets cost 79€ per person to include the welcome drink, a delicious starter platter and the two hour extravaganza. Reservations can be made by calling 722 332 669 or emailing reserva@posidoniabanus.com Get your tickets now!